Lussac-Saint-Émilion is a AOC located on the right bank of the Garonne and Dordogne rivers in Bordeaux. It's commonly grouped in with so-called satellites of Saint-Émilion. Lussac is planted to four of the five Bordeaux varietals, with Petit Verdot being the odd one out. Merlot is the dominant varietal of the four in most blends. This wine is composed of 70% Merlot, 15% Cabernet Franc, and 15% Cabernet Sauvignon. (25 years old vines) It's aged in 50% vats, 20% new French oak barrels, and 30% one year or older barrels. The wine is 100% Estate bottled. Chateau Bel-Air Lussac-St-Emilion is a winery that has been in existence for over a century and amazingly enough it's been owned by the same family. 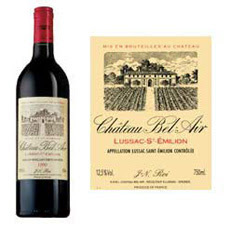 They have and amazing history and if you check out their small but well organized website -> Chateau Bel-Air You'll see labels pictures of old 1945 labels. Another neat thing is this bottle of wine is very inexpensive. I purchase a half bottle for $11.99 at the wine shop! On the nose I get the classic rustic right bank Merlot leatheriness that is quite common for wines from St. Emilion and it's satellites. It's almost like it smells earthy and austere. There is also some crushed blackberry notes that combine with hints of tar and graphite. On the palate the wine has a slender texture but packs some pretty astringent tannins on the finish. In fact the tannins are quite green and somewhat bitter. I must point out that this wine is far to young to be consumed and the winemaker would probably want to lynch me if he knew I was reviewing it as a baby. However, there is a overall rustic character to this wine and although it shows some decent cherry notes, the wine is far too bitter and green for me. There is a dirty soil character and a greenness about the tannins that I don't really find too appealing. I will try the other half of this bottle tomorrow and if it does decide to soften up a bit and shed some of its rusticity then I will report back. As for now I think this wine merits 82 points.